84% of students think they will graduate in 4 years. Only 38% actually graduate in 4 years. This will cause additional costs, living expenses, and longer time before start your future career. The longer you are in college, the higher likelihood that your normal life will get in the way and decrease your chances of graduating. Why is graduating in 4 years important? Each additional year of college can cost you over $15,000 in tuition, fees, room and board. Also, many schools offer a Finish in Four program that includes financial benefits for students. Finishing in the least amount of time possible can help you save money. Right now you might be a little scared, but after reading these tips you can be prepared for the challenges ahead and have a plan to graduate from college in 4 Years! College Choice – your initial college choice was not what you thought it would be, you will need to make a switch. Course Selection – Taking the correct courses towards your degree, will help you stay on track to graduate on time. Registering for classes that don’t go towards your major could be extra credit hours that cost you more in course fees. Another challenge is course availability. Classes can fill up quickly, therefore the student cannot sign up for the course for the upcoming semester. Cost – the cost of college has increased every year and can be too expensive if not budgeted properly in the beginning – tuition, fees, books, pizza, room and board, meals, travel, parking, MORE PIZZA! Family or Personal Challenges – you need to take time off or take less credit hours each semester and manage any life experiences. GPA – most colleges require a certain GPA to enter a specialized school or degree program, failure to hit that mark might mean repeating classes to increase your GPA. Did we miss any? Comment below for any reasons that could lead to not graduating in 4 Years. So now you know what to avoid and how to plan for your future, here are tips to help you graduate. What classes do you like, which ones do you hate? What extracurricular activities do you enjoy outside of the classroom? Get a summer job, preferably in a field you are interested in following, to gain experience and see if you like a specific career path. Take a quiz to figure out what is best for your strengths and weaknesses. Take the College Major Quiz to find your recommended majors. Research the major and career field – what types of students major in this, which classes will I take (do they coincide with the classes in #1? ), what are the career potentials (salary, job growth, careers where I live). Create a back-up plan – OK, I know you have your dream job and major in mind, but the reality is 50% of students change their majors at least once. Even if it is in the same “School of…” you at least have a plan for taking the right classes. For example: if you are thinking about Finance, many of the other business majors (Accounting, Marketing, Management, etc) might be a good fit as well for you, but make sure you have these in mind so you take the right classes. Even if you are thinking Finance or Biology, make sure you understand the core classes that you need to have completed by the beginning of your junior year. Or even think about a minor in one of those fields. Create a list of schools that offer your intended major (and backup), and research which schools you can afford financially each year. Look to FAFSA, scholarships and merit aid to get down to your estimated net tuition. Find out what schools you can afford by visiting the Tuition tab on your School’s page. These individuals will help you take the next steps to fulfilling your college and career plan. They will also help connect you with individuals in your career plan to do a job shadow, and can talk to you about your future campus. Your magic number is 120 total credit hours. Typically you will need to complete 15 credit hours per semester to stay on path to graduate in 4 years – 120 total credits (4 years x 30 credits per year). 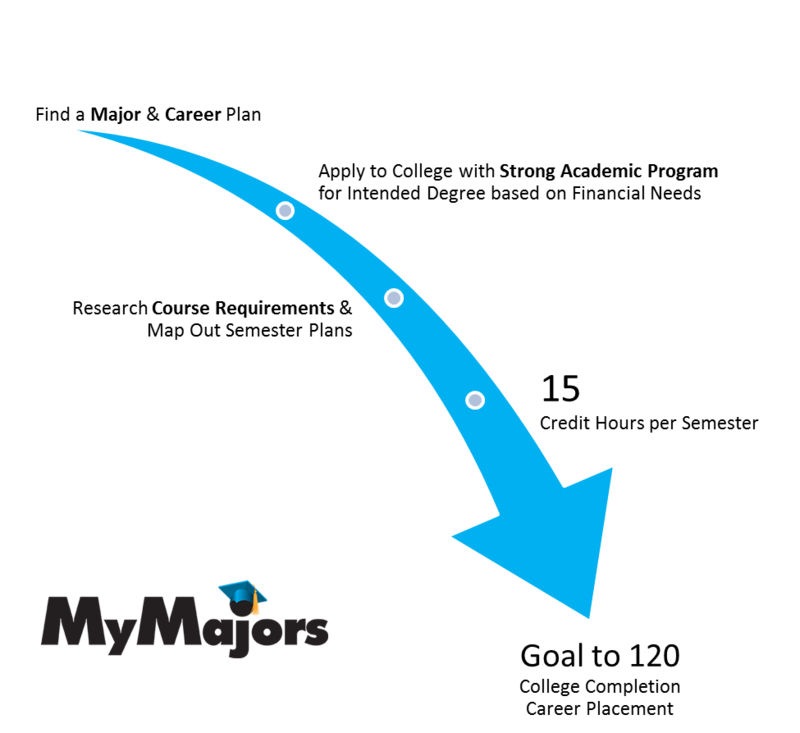 Some degrees and colleges require more credits for graduation, confirm the details with your advisor and tell them you are on a graduate in four plan. Normally 60 credit hours will be for your specific career and the other 60 will be core courses for graduation – choose these courses wisely for enhancing your education and working with your GPA. If you can’t complete 15 hours in a semester, think about taking summer classes online or on campus. Advice: if you know one semester you are taking a very challenging course, take 12 credit hours, and then take a 3 credit hour course over the summer to get back to 30 completed for the year. Even take that one difficult course in the summer so you will only have one class to focus your efforts for studying. Some degree programs, such as engineering, require students to be enrolled in degree required courses early their freshmen and sophomore year, which makes #2 on this list important to find out first. Any college student will tell you high school courses are very different than a college class and exam. This can impact your GPA your first semester of college, which might force you to fight to get your GPA back up. Many degree programs require a certain GPA to be accepted in that major/school. For example: to be an Accounting Major, you may need to have a 3.6 GPA compared to a Management Major may only be 3.0, this will influence your major and graduation time. If you completely mess up a class final exam, think about retaking the course over the summer to replace that eye sore on your GPA. The last thing you want in the final semester of Senior year is to realize you missed a required degree course to graduate. If it is one class, don’t stress, many schools will let you walk in May, but you will have to complete a summer course to finish your degree and receive your diploma. If you are short 6 or more hours, normally you will think about taking the fall semester and graduating after fall semester is completed. Many times graduating in 4 years is not the best plan for students. For example, if you need to work a full time job and are taking night classes, you might not be able to complete 15 credit hours per semester. Speaking with your Advisor you can create the best plan to complete your degree for what is right for you and your personal situation. Do you have any personal tips for students to graduate in 4 years? Add a comment below on your tips to share with others. If you liked the tips share this with your colleagues, students and friends.